Songs which play fine in iTunes do not play completely on the iPod. The song halts, and the ipod skips to the next song. The error is at a fixed point in each song. IE, Song A always skips at :40. Song B always skips at 3:27. Update: I no longer experience the problem since switching to a new computer. We may be closing in on a solution. 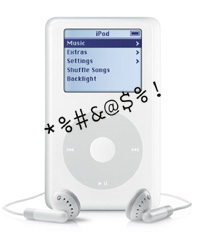 4th Generation "Click Wheel" ipod. Firmware 3.0.2. USB 2.0. The error-correction setting (on/off) has no effect. I sent my iPod to Apple's depot for repair, but no problem was found in their diagnostics. The problem persisted, so I exchanged my iPod at an Apple Store. The problem is present in the replacement part. This is not the VBR mp3 problem as all songs are encoded with iTunes 4.7 using AAC. As mentioned above, these are my songs; this is not a case of DRM'd songs from the iTMS that must first be played in iTunes to "authorize them." These are short songs, not multi-hour jams that fill the RAM buffer. A full restore of the ipod does not help. These songs play fine on the PC. I can delete the song from the ipod and let it resync with the library, and the problem disappears. The song itself must not be corrupt, only the particular instance on the ipod. TODO try "known-good" music, such as that used by Carrie. While I'm mostly concerned with newly encoded AAC files, I've experienced the Problem with constant bit rate MP3s that I've had for years. doesn't matter if songs were encoded on my athlon dekstop or pentium laptop. downgrading to 4.6 and 3.0.1 does not help. reinstalling itunes into a new user account / rebuilding the library does not help. Email me with suggestions or "me too's" and I will post them. Ipod is overly sensitive to anomalies in songs. I noticed a song with a little "jump-cut" (it jumps forward by a split second). In itunes it continues to play, but on ipod, it fails. The delete-resync workaround does not help, so it is a different issue than the one described above despite a similar end-result. I started using a different computer about 3 weeks ago, and the ipod is a lot happier (only one messed up song out of hundreds played vs 20-30% failure from before). The problem is, I don't know why -- I have an overly complicated theory... I'll describe the old machine; maybe you'll see something in common. I never tried a disk defragger on the ipod because it seemed too stressful for the ipod's disk, but it might fix the problem if my theory is right. Update: here's a more concrete solution involving a watchdog process interfering with the USB port. Another potential fix: MP3val is a Free tool that detects and corrects MP3 files. Thanks to Ryan for bringing this to my attention. Submitted by kbarr on September 6, 2008 - 6:26pm. I was experiencing a similar problem on my 80GB iPod I just purchased August of 2008. It would skip to the next song after 15 seconds for this one song. It only did this on the iPod. Tried every solution that I could google. Nothing worked. I decided it was a issue with the MP3 that the iPod would just skip when encountered. Imported the MP3 into Audacity and found that the bass peaks were outside the frequency range and that the first bass peak was 15sec into the song. So I used Audacity to record the song being played from my WAVE OUT with the microphone volume turned down (keeps the peaks within limits). Copied that file to the iPod and it plays fine now. Submitted by kbarr on June 15, 2007 - 11:00pm. I found your research in this matter on your web site. I have experienced the same kind of problem. Although I did go as deep into it as you did. I am playing songs in my car very often and I am very annoyed when it keeps skipping at the same spot. But I realized that playing the same song from a playing list leads to a different result. A song that keeps skipping when played from the selection via album play straight through if selected from a playing list. p.s. : ipod is 5th gen. with latest update. problem stems from meta data corruption? Submitted by kbarr on June 15, 2007 - 10:58pm. ...Nonetheless, I think that the one last theory left standing, might lead somewhere. Let me start from the beginning. As I am a quality freak, I tend to rip my CDs with EAC and later encode them with LAME, on a VBR setting between 224-320 kbps. When I don't have something I want amongst my CDs, I download it. So, it is only natural for me to re-encode downloaded tracks if they have been ripped using bitrate lower than 224, with the same setting I am using when I encode the WAVs from my CDs, in order to obtain a slighly better quality than the one they allready have when I download them. I also have the habit of adding a track in my iTunes library after I have downloaded it and before I re-encode it, in order to listen to it and since I wish to keep my playcounts as close to reality as possible, after I have listened to it I don't remove that track from iTunes, but leave it there instead, so that, when I have the new, re-encoded tracks ready to be added to the library and in the directory I keep my proper music files, I rename or remove the primary downloaded track so that iTunes cannot find it and will prompt me to locate it. So then I submit the directory in which the proper [re-encoded] file is. It is only natural that, if some attributes of the final mp3 have been changed [ thebitrate and other tags I have added to it], iTunes will refresh the properties panel and show the new ones. My point is that, I as I have come to notice, the tracks my iPod skips, up to now belong to this particular group: songs that I have added in the library and listened to, and afterwards having iTunes 'lose them', in order to introduce it to others, ones that are totally different files than the one it knew. Maybe, in some way this has something to do with it? On the other hand, as I said, when you give a file to iTunes after being urged to locate it, it refreshes the properties of the original with the one you give it. I have also checked the properties of those tracks [the ones it skips], as opposed to those of which play properly in the iTunes library file, and the values are as they were supposed to be. The duration value is as it should have been too. Then again we both know that iPod very well knows the true duration of the tracks it skips; we can see that on screen when it's playing them. So, could this thing have anything to do with our issue? As I think you have stated, it used to do this with hundreds of your tracks. I suppose that all those tracks of yours can't have this in common. I know that changing computer might fix/smooth the problem, but I do not have this privilege, unless of course I format my computer and re-install windows and iTunes. Sadly, I am afraid this is not an option either because, if the problem lies within the iTunes database and the library file somehow [which I strongly suspect will ultimately be what there is to it], doing so should not fix the problem, since I plan on saving the library file and later loading it to the fresh installation of iTunes in order to prevent loss of all those tracks' playcounts [which I could afford if this was the answer to my problem] and ratings [which I don't think I could afford since I cannot possibly re-enter a rating for so many songs]. If this could help, here is what I have, along with an attached saved copy of iPod diagnostics I run through iTunes.